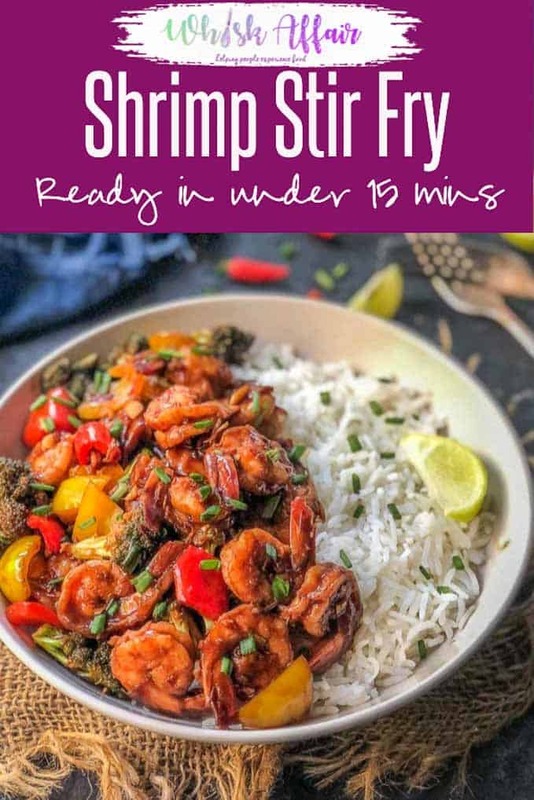 An instant meal to serve under 15 minutes, Shrimp Stir Fry is a healthy, simple saute of shrimps, veggies and exotic sauces. You may serve this easy Asian meal as it is or with noodles or with rice. Here is how to make Shrimp Stir Fry Recipe. Making Indian meals back to back often seems like a rut to me. Moreover, especially when you come back from a trip, making elaborate dishes is the last thing on my mind. During such a fix, making one-pot meals or quickies like Asian Vegetable and Tofu Stir-Fry is a great respite and saviour. And with a pack of shrimps around, even easy Shrimp Stir Fry can be made. I have been growing a home-garden for quite a few years now. So, whenever I get some fresh produce, I stir fry them up with fresh ginger, green onions, vegetable oil or sesame oil, soy sauce, salt and pepper for 2-3 minutes. Add some protein and aquick meal is ready in no time. 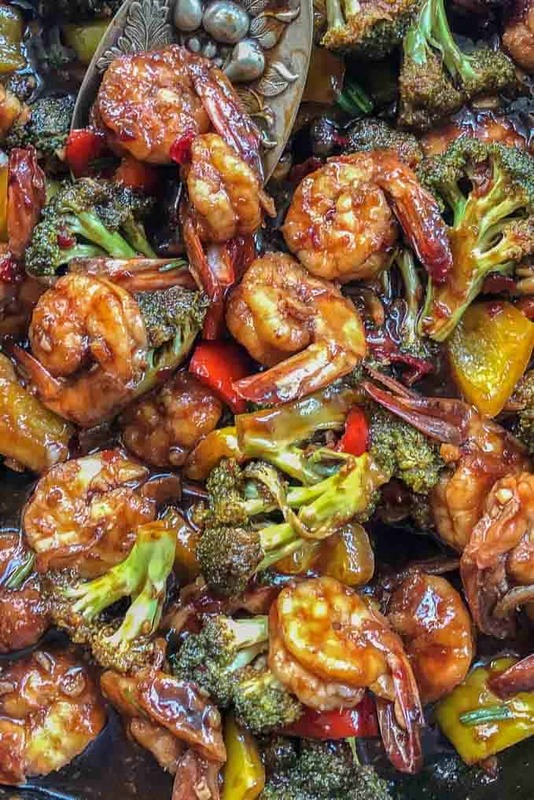 This Stir Fry Shrimp and Broccoli is also made in a similar fashion. Shrimps are full of protein, and vitamins like B12, phosphorous. Hence, you pair them with broccoli, bell peppers, asparagus, zucchini – health goals met! The mix of sauces, orange juice, brown sugar makes this stir-fry meal very saucy and crisp at the same time. Add the shrimp to this mix along with all the veggies, cornstarch mixture and it magically transforms to a filling meal. Don’t feel surprised if even your kiddos help you out when you cook stirring this meal. You may also add pineapple to make it more exotic and lip-smacking just so as to balance it all up, you know! I do not like much spicy shrimp but you can make it sizzling and pungent if you want. You can make this stir fry by adding chicken, beef, scallops or even sausages along with the shrimp. If using chicken, fry the boneless chicken cut into small pieces and take out on a plate. Then add the shrimp and fry them as the cooking time for both are different. Same goes for beef. If using scallops and sausages, toss them in the pan along with shrimps and cook along. You can add veggies like asparagus, zucchini, snow peas, mushroom cabbage etc along with broccoli to make this stir even more healthy. Replace the brown sugar with honey and increase the amount of garlic and make Honey Garlic Shrimp Stir Fry. You can use store bough teriyaki sauce if you wish to. I however, suggest making the sauce from scratch as it is super simple and very economical to make at home. Plus you know what’s going in your food. Add chopped Pineapple in the stir fry for a tangy taste. To make a Thai version, you can saute the shrimp in peanut butter and then add some red curry paste and coconut milk to make the sauce. Add the remaining ingredients as mentioned below in the recipe for a Thai flavour. Clean the shrimp well and remove the vein. Dry the shrimp as much as you can using a kitchen towel. Use large shrimp and fry the shrimps for only 2-3 minutes. If overcooked, shrimps becomes rubbery and you will not like the texture. Increase or decrease the amount of red chilli paste as per your liking. 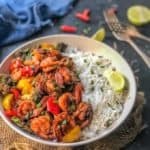 What to serve with Shrimp Stir Fry? This stir fry goes well with rice and noodles. You can even toss it with steamed rice in the wok and make Shrimp and Rice Stir Fry or with noodles to make Shrimp and Noodles Stir Fry. If looking for a healthier option, serve it with cauliflower rice. Plain cauliflower will work good and I also have a Asian Cauliflower Rice Recipe which you would want to check. 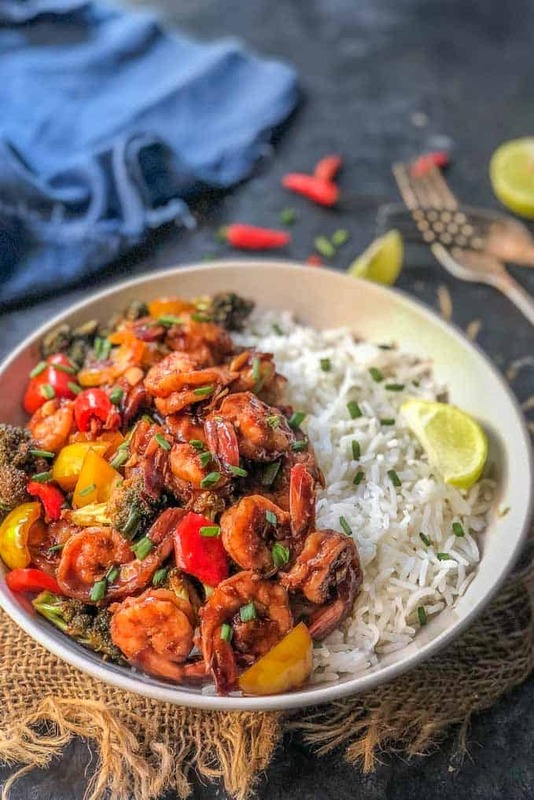 An instant meal to serve under 30 minutes, Shrimp Stir Fry is a healthy, simple saute of shrimps, veggies and exotic sauces. You may serve this easy Asian meal as it is or with noodles or with rice. Here is how to make Shrimp Stir Fry Recipe. Mix soy sauce, oyster sauce, orange juice, ginger, garlic and brown sugar in a bowl and keep aside. Once the oil is hot, add the shrimps and saute on high heat until they turn pink. Remove the shrimps on a plate. Add broccoli and bell peppers in the wok and saute for 2 minutes. Add the fried shrimps, sauce mixture and red chilli paste and cook for a minute. Mix cornflour in water and add it in the wok and cook until the sauce thickens.